On the day before my flight left, I hit up a local supermarket's grab-and-go counter. To my delight, but not really surprise, there waiting for me was vegan sushi in a convenient travel container - perfect fit for my carry-on. And with it, a little soy sauce and pickled ginger. To my surprise, a bonus find of one of my personal favs - seaweed salad (very nutrient dense). I just had to be sure to grab a plastic fork from the in-store cafe on my way out. I always request a room with a mini fridge, so storage was no problem. The trick is to remember to grab everything as you're bolting to your plane the next morning. I have since done this many times - hitting up Whole Foods or the local grocers depending on where I am. The stress of making mad dash through the airport for vegan scraps prior to boarding is gone! 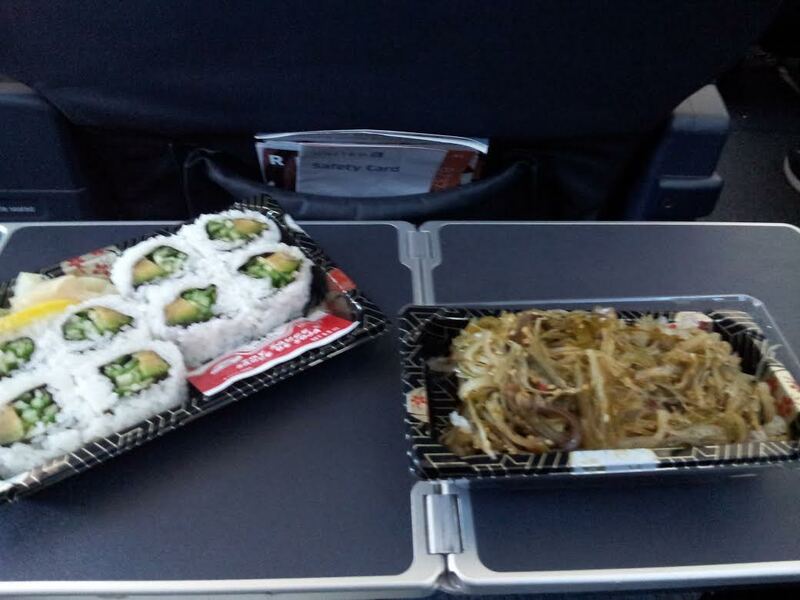 I love indulging on my fresh grab-and-go vegan finds and typically, my neighboring fellow travelers look on with envy as their questionable in-flight meals are served.